Though it seems like a driveway is “just a driveway,” in truth – it is so much more. An aesthetically-pleasing driveway, made from a combination of paver styles with edging and curves, goes a long way to improving the value of your home, as well as the curb appeal and a general sense of enjoyment every time you come home. 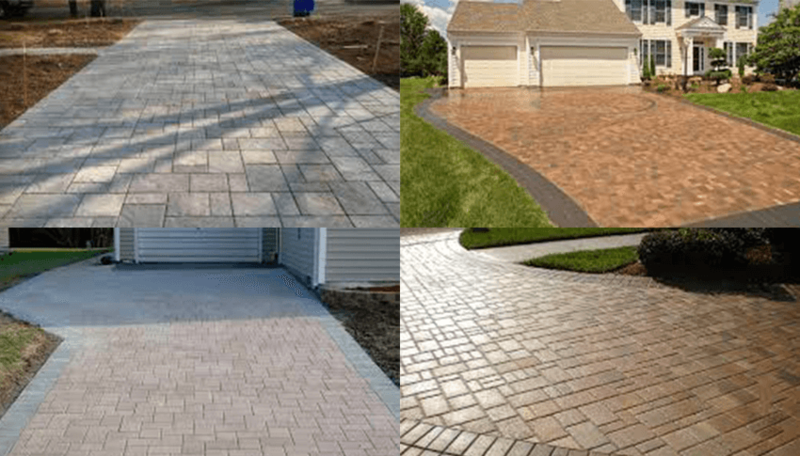 If you are considering a new driveway, ditch the boring cement slab and try a paver driveway – with Rescue Landscaping, they’re more affordable than you might think. Our custom driveways are installed in a similar way to our paver patios & walkways with a few key differences. If permits are needed, we will pull them for you. We install the edging and a compacted minus base, implement grading so that water will run away from the foundation of the home, and add any necessary drainage systems. Your patio will not shift and weeds will not grow between the pavers because of our process of using polymeric sand. We guarantee that your Rescue Landscaping driveway will last for years to come – we use a careful process and pay attention to every detail. And as always, when we are finished, we perform a thorough cleanup and look over the driveway with you to ensure your satisfaction. Our consultations free, so contact us today for your risk-free driveway quote and see how attractive a new driveway can be. Driveway drainage and creep is a big issue in the St. Louis area. When we get rain, we get a lot of rain, so we will always recommend taking the extra step to install a drainage system underneath your driveway. Proper drainage allows water to permeate through the pavers into the system that’s installed below your driveway. Once we discuss your driveway and the design that will be most functional and beautiful, we will also recommend the correct drainage system that will work best for your slope and landscape. If you’re considering a new driveway and walkway, sprucing up your landscaping, adding an outdoor living area, or you need some structural or aesthetic improvements – hiring Rescue Landscaping professional designers and installers makes it simple and budget-friendly. We want you to have a stunning end-result that’ll make you love coming home. We have had Rescue Landscaping over for a couple of small jobs, a small paver project and fall leaf removal. In both cases he and his staff did a great job and provided us courteous service and a reasonable price. I am pleased to report that after 2 years the paver area Bob created for me has stayed perfectly level and neat looking, just like the day he placed it. They were friendly, professional, and efficient. Bob is a great guy to deal with–he’s very friendly and very communicative. He kept us posted on what was going to happen when, worked around our schedule, We talked beforehand about materials options and divided our wish list into phases so that we could get the most for the money we had available. Highly recommend their services. They are punctual, reasonably priced, and the quality of work for a landscaping company is exceptional! You won’t regret giving them a call.